An all-breed pointing dog hunt test over two lovely early autumn days in Pennsylvania's York Pointer and Setter Club. We got a few shots from the event. 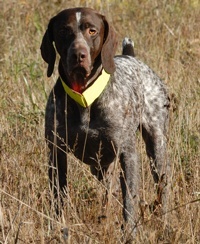 A German Wirehair watches the bird field from the line. Wayne and Judy load up a bird bag with quail. Those birds will be scattered along the back course so that the brace of dogs will encounter them. They will just be flushed to test the dogs' steadiness as the handlers fire blank guns. Walking up the woodline to the breakway area. Nice control - it's hard to keep a slack lead on a GSP when there are birds in the same zip code. Well across the bird field, a Brittany and his handler head into the hot zone. 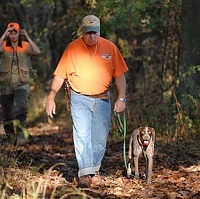 The handler on the right follows his shorthair, the handler in the middle tracks his Viszla off to the right, and the gunner on the left watches the dance, trying to decide which team to shadow into a point on a bird. A crafty escapee from an early brace strolls along the edge of a field boundary treeline. An chukar up and walking around like this can really push a dog's buttons. Top o' the morning to you too, Billy! He's not just being polite, here. He's holding up his hat to make sure that the judges - across the field - are aware his Weim is on point. There's another important party that's aware of that point: the Shorthair on the right is honoring the Weimaraner. Essentially, he's pointing the pointing dog. A Weim does a high-speed drive-by near a waiting gunner. On a retrieve, chukar on board. Matt interviews the witness while Wayne performs an autopsy and ballistics analysis on the victim. With his Shorthair on point farther down the field, a handler raises his hand to let the judges know that he intends to work that bird. The gunners knock down the chukar flushed by the standing dog's handler. In the foreground, the backing dog's handler crouches to steady his dog - which is acceptable (in fact, often encouraged by the judges) in a senior-level test. 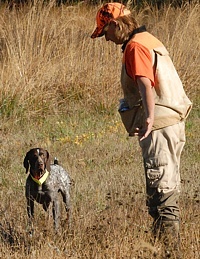 The GSP has retrieved to hand, and her handler is delivering the chukar to a gunner. Not all handlers want or need a dead bird, but the pile that the gunners collect quickly turn into training aids or lovely meals. A badly damaged bird feeds the foxes and other scavangers. More grimace than smile, actually. That gunner on the left had to shoot that partridge some yards closer than he'd have liked (making something of a mess). The retrieving Weim didn't even hesitate (many dogs would). A dog going above and beyond always brings a smile. A long nose. Always trust your dog! The chukar he's on is easily 20 paces ahead in the wind. Relocated for an easier-to-follow point, the Shorthair locks up tight on the bird as a gunner comes in on his flank. Up goes the chukar, but only one gunner has a safe angle on it. On the retrieve, this GSP has a mouthful. With the senior braces done, Josey here spends a little time in field checking out where the action was. He's come to a hard stop at the edge of some cover in the bird field. Alas, it's a hot spot. There's a handful of chukar feathers there. Good opportunity for him to learn how to work out the difference, though. After another bit of hard work around the lower part of the field, Josey locks up in the shade of a treeline where the chukar have covied up. Lisa steadies Josey, who is well aware of a chukar just a few yards away. Josey moves to mark birds flushing out the far side of the cover he's pointing. A new hunt test title! And another, for her brother. A little post-test time pulling burrs, checking for ticks, and maintaining the bond. Also doing cleanup duty down at the bird field, an Upland Life mascot sets up 20 paces from a covey of chukar. The chukar have flushed into some shaded weeds along the woods. This intense fellow got a nose on them, and now has an eye on one. Easy, there, buddy! 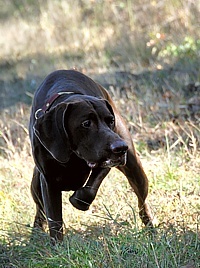 An up-and-walking partridge only 10 feet away is a lot of pressure for a versatile dog that likes to retrieve.